For this sample analysis, consider a business in an urban area, with some level of dependence on foot traffic for their sales. In this case, the only item provided by the business is three years worth of daily sales totals. From this basic analysis, the only thing a business can really say about itself, is "we're doing well"
ActionStat goes deeper into the data. The reasons behind the observed trends can often have profound implications for what to expect in the future. In this example, growth seems steady from year to year, but the reasons for that growth have not been consistent! By looking into possible explanations for the observed ongoing increase in revenue, it can be seen that the sales increase from Year 1 to Year 2 was mostly due to the economic conditions in the area. Per Capita GDP grew several percent, and the specific neighborhood the business was in saw an increase in population density, likely associated with more foot traffic. However, from Year 2 to Year 3, the economy grew slower and so did the specific neighborhood. 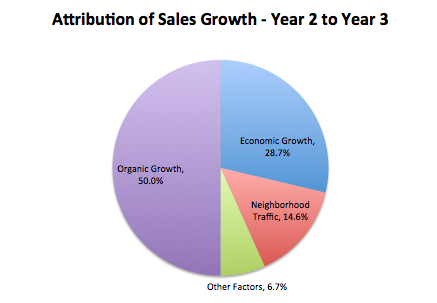 Therefore, an attribution analysis will indicate that much more of the growth in sales from Year 2 to Year 3 was "organic"
In this case, it would be wise for the business to focus more on changes made later on, to create the growth from Year 2 to Year 3, as they likely had more to do with driving business. Each business is unique, and impacted by a variety of factors. While it is impossible to analyze every factor that can impact a business, a deeper look into data, with some awareness of the business, can produce further insights that can help an organization improve its operations. For example, this sample business is dependent on foot traffic, which varies by time of the week and season. Understanding how workload depends on day of the week and season can help a business organize its labor resources to meet customer demands in a timely manner during busy period while wasting less during slower times. What is the economic outlook, and how would a change in economic conditions impact sales? In this case, could an anticipated return to warmer and drier weather foretell a busy weekend? Are there consumer trends, or other external factors to be concerned with? Can we build a model to forecast sales, growth, workload, or supply needs on a daily, monthly, or quarterly basis?